Pursing a double major degree in Computer Science and Dance might seem implausible at first glance. However, Juett Carty, the 2014 JNGI Rex Nettleford Scholarship Dance Scholarship recipient, has found a way to pursue her passion. Juett, 24, is completing a Bachelor of Arts in Dance Education at the Edna Manley College of the Visual and Performing Arts. This is being done jointly with a degree in Computer Science, being pursued at The University of the West Indies, Mona. She is the first student to have combined these subjects; but then, she is accustomed to following her own path. She credits the influence of her brother Bolivar, who was involved in dance through the Davyton United Church, and who later started his own dance group, as having a formative influence on her life. She, along with her sister Karlia, followed naturally in his footsteps. In high school at DeCarteret College, Mandeville, she played the flute and did speech performances in her spare time. But above all, she wanted to dance. “When Rex Nettleford was on television doing a performance, my dad would call me; and I would be locked to the screen until it was finished. I would not do anything else,” the dancer recalls. “In my circle of friends, there was a craze about Nokia phones. I was fascinated and wanted to know how they were made and how they got games on the device.” It was this interest in phones which led her to do computer programming when she reached sixth form. 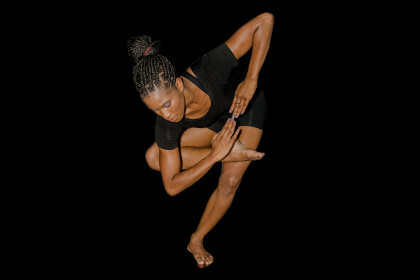 She applied to do a degree in Computer Science at The UWI, and then looked at the options for following her love for dance. 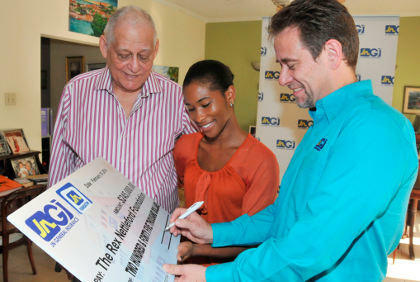 Juett Carty (centre), recipient of the 2014 JNGI Rex Nettleford Dance Scholarship, has her cheque signed by Chris Hind (right), General Manager, JN General Insurance Company, whileSir Alister McIntyre, director of the Rex Nettleford Foundation looks on. The opportunity only emerged when she became a member of The UWI Dance Society, and through her own research, realised that such a double major, linking with the dance programme at the Edna Manley College, could be created. She then had to get acceptance into the Edna Manley College, and have them request permission for her to pursue the joint programme with the UWI. Juett also had to overcome the logistical difficulties of attending classes on two campuses, which required tight scheduling. And…. she had to dance. She explains that it is a lot of work, but fortunately she acquired some level of flexibility from doing gymnastics earlier. The skills she has acquired in programming, software research and testing, troubleshooting, as well as camera configuration, provide the basis for hers optimism, that she can play a role in helping people to express their mental concepts to the wider public, through the direct use of technology. Juett Carty aims to take on this new challenge, following her double graduations when she completes her programme later this year.